Earrings add to a women's natural beauty. If it is studded with diamonds, there is nothing the female kind would love more. Real Tanzanite and Diamond Flower Earrings is one such product that serves as a perfect ornament for classy and elegant women. The accessory, made of 10K white gold, flaunts a beautiful flower design made of one Tanzanite gemstone surrounded by few smaller Diamonds. The accessory is not too heavy either. Neither the 6x4 mm gemstone nor the diamonds add much to the weight of the earrings. You can wear this light weight trendsetter to events of any kind. You can choose to use it as a daily wear. It would also look great when worn with fancy dresses for elegant parties. 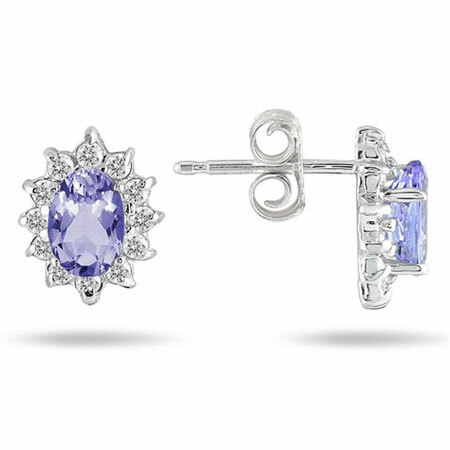 While the earrings and Tanzanite are oval in shape, the diamonds are all shiny circular pieces. This easy to wear push back stud is definitely a must-have. We guarantee our Real Tanzanite and Diamond Flower Earrings to be high quality, authentic jewelry, as described above.